Bsaving Coupons is a browser add-on which is also regarded as adware. 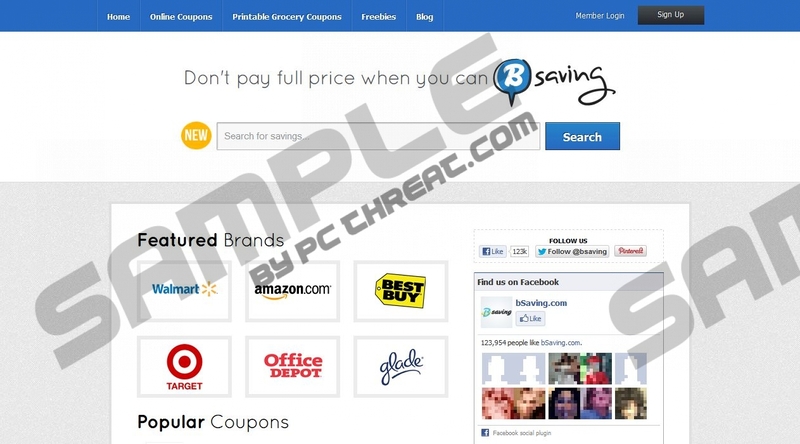 The application is associated with bsaving.com which provides its visitors with a great variety of coupons enabling them to buy cheaper items at Walmart, Target, Amazon, and so on. Like the majority of applications, Bsaving Coupons is installed alongside freeware or shareware. The application, which is installed as bSaving, is set on your browsers as a browser helper object. It means that your actions on the Internet are monitored in order to collect non-personally identifiable information which will be used for enhancing the services and products. However, bSaving Coupons can gather such information as your name, address, telephone number, gender, etc with the help of the forms which you may be asked to fill out, not to mention Facebook, Twitter and Pinterest buttons enabling you to share the coupons with your friends. Bsaving Coupons, if installed unintentionally, may seem annoying and worthless, or even treated as a virus. Moreover, when the add-on is being installed on its own, the wording of its License Agreement suggests that bSaving Toolbar may be added to your browsers. If you have a toolbar, be it a product of bSaving or some third-party, we recommend you remove it from the PC. In this way you will prevent malware attacks, unwanted system disorders, and unexpected coupons that pop up while browsing Dell, Amazon or other websites. Get even more savings with exclusive deals. Dell Home & Home Office – Free shipping on everything from Dell Home! In order to remove Bsaving Coupons, follow our step-by-step removal guidelines. They will help you uninstall bSaving and remove the add-on so that Bsaving Coupons do not disturb you any longer. Note that it is important that you scan the PC for malware once you complete the removal procedures. Under Programs or Programs and Features, click on Uninstall a Program. Mark bSaving and click on the Remove button. Move the mouse over the bottom left corner of the screen. When a mini Metro UI or a minimized version of your desktop pops up, right-click it. Right-click bSaving and select Uninstall. Press and hold the Alt key and then press the T key. Click on Toolbars and Extensions and disable bSaving if it is still present. Press and hold down Ctrl, do not release the key and press Shift and then click on the A key. Press and hold down the Alt key and press F.
Move the mouse over the Tools option and select Extensions. Remove bSaving by clicking on the trash bin icon. Your next step should be a removal of all the harmful components which are present within the system. To find out whether or not some exist within the system, scan the PC using our free scanner which you will easily install on the PC after clicking on the download button. Quick & tested solution for Bsaving Coupons removal.